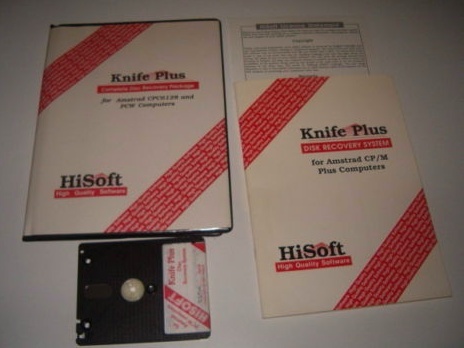 The Knife from Hisoft is another in its long line of products for the Amstrad range of computers. This one is a disc sector editor and file patcher for the serious disc user. 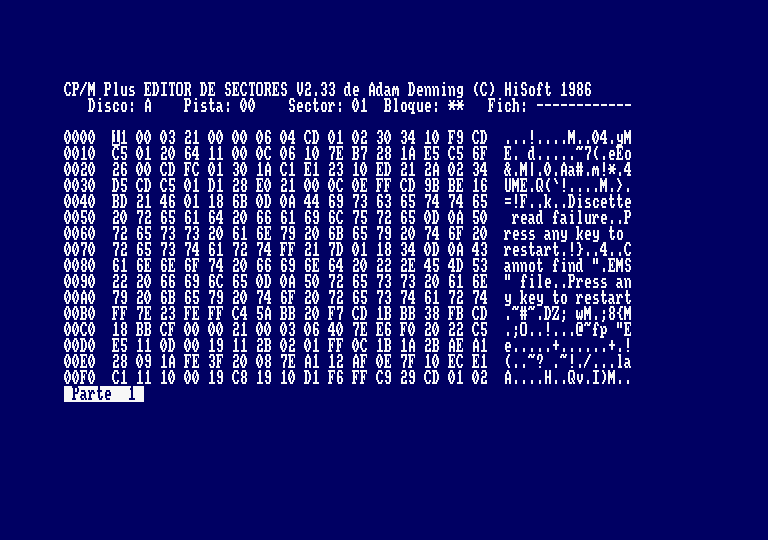 The disc contains eight files of which two are actual disc editors, some are useful utilities and the last is a text file which contains information about the latest updates to the disc. Hisoft's policy of continually improving its products means that it adds features faster than the printers can keep up - this file tells you what the latest improvements or added commands do. 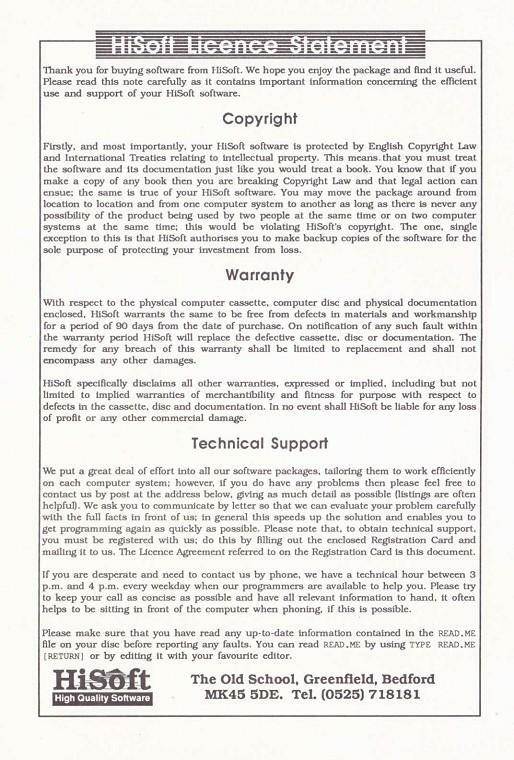 The file can be read with TYPE READ.ME when in CP/M or PIPped to your printer. In fact if you have any sensible suggestions for additions to the programs, then Hisoft may include them. If you wish to take advantage of the new features Hisoft will update your disc for a nominal fee - contact them for more details. The two main programs are called Knife and Knife2, and they work in very different ways as they are aimed at slightly different categories of people. The Knife is menu driven and will allow you to work on sectors or files. If you work in sectors you can examine CP/M logical sized sectors of 128 bytes, either just moving forward and backwards through the disc or going straight to a specific track or sector. In this case you can either change the contents of a sector by typing in hexadecimal numbers or plain text after you have moved to the correct place using the cursor keys. If you wish, you can print out the contents of a sector before you start altering it, or as a reminder of what you have done. You also have the facility to swap parts of the disc around. Knife will allow you to store a sector, move to somewhere else and copy it into its new position. There is a search facility which will allow you to search for a string of 16 hexadecimal numbers or a string of text. You can use a binary mask on the search which will allow you to get a match on a string which contains a mixture of upper and lower case letters even if your search string doesn't - very useful. If you work in file format you have all the same features as before, but this time you can enter the file name and even the user number if you have used this feature, and follow a file across the disc. This ability to trace a file is very useful as disc programs are not always laid out simply - they are put wherever there is space on the disc. In contrast, Knife2 is a completely different type of sector editor - perhaps it should have been called Fork. It works on Amstrad's 512 byte physical sectors which are the equivalent of four CP/M sectors in one. This program is for the serious hacker who wants to get down to the nitty gritty of disc editing. All the commands are selected by Ctrl and a letter, but are very easy to remember. Knife2 pulls in one 512 byte sector at a time and displays 256 bytes of it on the screen, allowing you to toggle between the two halves. Move around the display with the cursor keys and you can type in your changes in hexadecimal or Ascii. As with the Knife you can write a sector back to where it came from or to a different one, although this time they are the full 512 byte sectors instead of the Knife's 128 byte sectors. You may search for a string of up to 80 bytes of hex, decimal or Ascii text with the same optional mask facility as Knife. The cursor is placed at the start of the string when found, but with an added feature. When you are searching for Ascii text and you cannot remember what the mask is, to allow you to catch both upper and lower case, then a mask value of zero will allow you to choose from a match on upper case, lower case or either, which is even more useful. If a string is found but is not the one you want, you can move to the next occurrence of the string if there is one. Moving forward and backwards through the disc by a sector or track at a time is easily done using the shifted cursor keys or, as with Knife, you may select which track or sector you want and go straight there. In the directory you can see that CP/M divides your programs across several tracks and sectors, and numbers each block. A block is the equivalent of two sectors, and two programs may share a block. CP/M starts its numbers at the directory, so you can move directly to it at any time by selecting block zero. Knife2 will display your present track, sector, filename (if any) and the block number, unless you are in CP/M's reserved tracks, when it displays ** for the block as they aren't numbered. This means that when you jump to a track and sector or a block, which you read from the directory, you always know which program you are looking through. 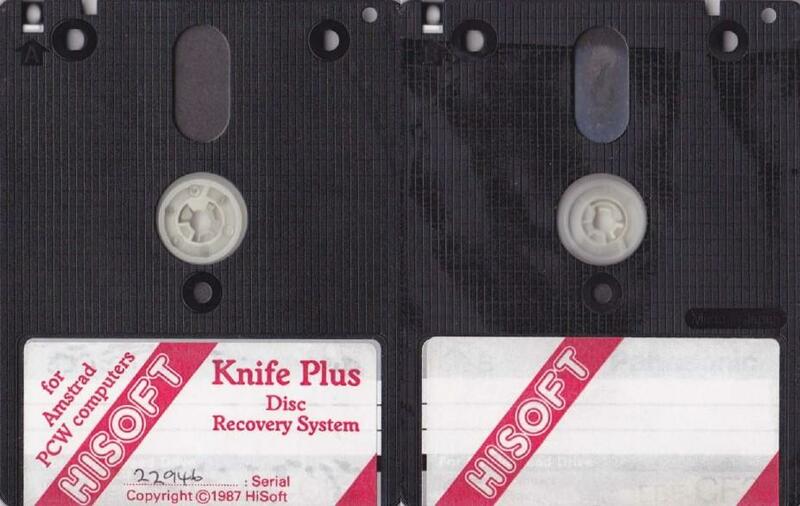 As with the Knife you can follow a file through its convoluted path across the disc. Of course the obvious thing would be for you to go straight to a file by selecting its name from the directory, and of course you can do this. You only need to type in as many letters of the filename as is needed to get a match. For instance if you have a file called "WASSNAME.BIN" and a file called "WHATME.BAS" you only need to enter "WA" to get a match on the first or "WH" for the second - a feature I found very useful. Both Knife and Knife2 work with CP/M 2.2 and CP/M Plus, and alter their signing on messages accordingly. But as the PCW 8256 (Joyce) has a different keyboard layout, for instance, there is no Copy key. There is a program called KNCONFIG.COM which will allow you to decide which commands use which keys, so you can customise the program to your own taste. This has been done for you and the program KNIFE2J.COM already has them set up for the PCW 8256 with the list documented in the READ.ME text. You may still use KNCONFIG.COM to change either of the Knife2 programs if they don't suit you, but as I said, I found them all very easy to use and remember. CTRL-B for block, CTRL-T for track and so on. The remaining programs are small but useful utilities. WDEL.COM is a menu driven file erasing program. It will accept normal CP/M wildcards and step through the chosen files allowing you to erase all of them, none of them, or choose each one in turn. SDIR will give you an extended directory, telling you how many records there are in a file, whether there are any Extents and what their status is - SYS or DIR and RW or RO - and it will also tell you the remaining space on the disc, which is something I missed from the normal CP/M DIR command. This is so useful and small that I have copied it on to all my CP/M discs. and UNERA "name" to restore it, provided it has not been overwritten. This is quicker and easier than using either Knife or Knife2 to actually find and change the directory sectors. Both programs can cope with all the different disc formats that the Amstrads use. In addition to its other uses, KNCONFIG.COM will also allow you to alter the number of tracks that Knife2 expects to find on the disc, and so will handle the discs on the PCW 8256 second disc drive - although you should save a differently configured version of the program specifically for this or you could upset AMDOS if you try to move a track that doesn't exist on a normal disc. All in all, the two main programs complement each other beautifully, and the extra utilities are very useful additions to the package. They are also the first disc editors for the PCW 8256. 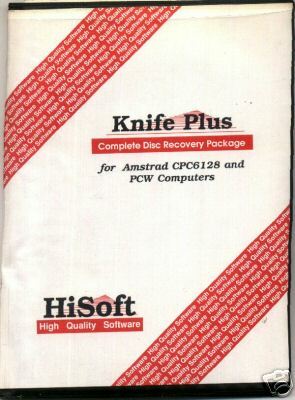 So if you need to repair your disc, examine other people's discs (for instance several games discs have files on them that have merely been erased from the directory - a swift look with Knife2 and either change the E5 bytes to 00 or use UNERA.COM) or simply learn about how CP/M and AMSDOS use the discs, then this package is for you.